Look what Bronwyn whipped up in a day! All 42 blocks for the Spot the Yo-Yo quilt. It looks wonderful in all the brights. Just needs the background triangles, sashings and borders and the top will be finished. And yes, Bronwyn's had so much fun making it there are plans for another one. 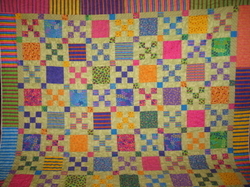 This fabulous quilt was made by Helen for her daughter. The fabrics were purchased four years ago while on holiday in New Zealand. 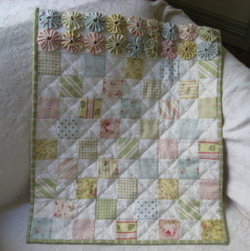 I think this quilt is truly amazing as Helen loves antique reproduction prints. How difficult is it, to work with fabrics that are not your first, or even your second love, not to mention ones purchased so long ago? My favourite day of the year came and went very quickly. No I'm not talking about Christmas Day, I mean Boxing Day. I love Boxing Day. This is the day I love to loll around reading a book (usually a Christmas present) and not do very much else. You know how you can feel a little guilty at the end of a day when you look back and think about the things you didn't do. Boxing Day is my guilt-free day. This is the one day of the year when I truly feel its OK to do as little as possible. No-one's going to go hungry - the fridge is full of leftovers - and who feels like eating anyway! So there I was reading (way too fast) my new book (Goddess, the third in the Percheron series by Fiona McIntosh) . It was only mid-morning and I was nearly half way through it. How to make it last? So I started a quilt. 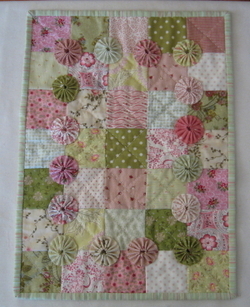 Jan's 'Spot the Yo-Yo' quilt. You remember, the fabric I wasn't going to buy. I ironed the fabric, cut a couple of strips, some triangles and went back to reading. The story had me in it's grip and I wasn't going to be able to focus on anything else until it was finished! And this is how far I've got. 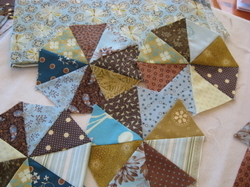 I've cut about half the triangles, and then as you do, had to sew some together, just to see how it worked. 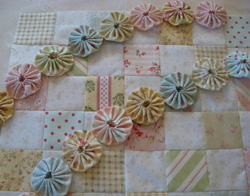 Then I stopped because I suddenly felt inpsired to make another small quilt with a few yo-yo's decorating it. 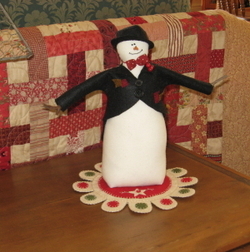 This little doll's quilt is the first project I made using the Clover Yo-Yo maker. 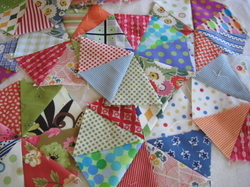 As I was making it new ideas kept popping into my head for little quilts decorated with yo-yos but deadlines for classes, magazines and workshops didn't allow me the chance to follow any of these ideas through. Then when I did get back to making yo-yos it was for my 'cat'. So yesterday, in the middle of making the new quilt, I was off fossicking through my scrap fabrics looking for just the right pieces. You know the saying about 'happy as a pig in mud', yes, that was me with my fabric scraps. And this is where I am upto. 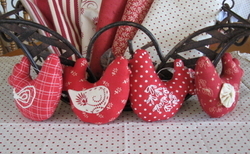 The yo-yos are made, the fabrics pieced, now I just have to bind, quilt and attach the yo-yos. 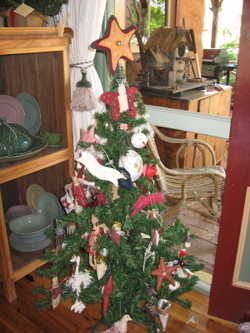 We had a lovely Christmas, lunch at the river - prawns and pavlova, then tea with friends. A very relaxing and pleasant day. Hope yours was too. It's only mid afternoon, Christmas Eve, and I've finished making the presents. I'm not sure what to do with myself now. I've been working towards a goal and now find myself feeling a little bit flat. This one I finished yesterday. I wasn't quite sure how the little felt rug would turn out. I made the tongues and liked them but as a whole it wasn't working with an all cream centre. Added the red and the star and suddenly it all came together. Can't wait to make one for myself now. My button tree is just right for it. This is the last present to be made. 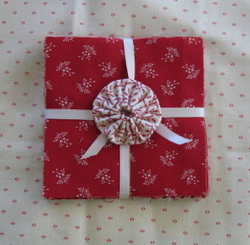 A simple pouch with a pocket for a gift voucher inside. 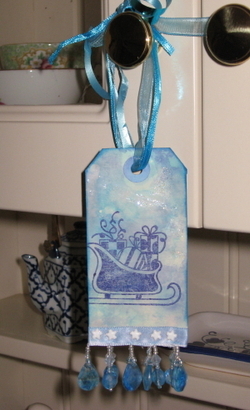 I've lost count of how many gifts I've made this Christmas decorated with this little tag. And how simple is this! A few favourite fabrics cut ready for making the large Yo-Yos. Just in case you need a very very last minute gift idea. So now I am heading for the kitchen. No I won't be posting photos of anything I cook. I'm going to do as much as possible today so I can enjoy tomorrow and maybe fit in a little snooze between lunch and tea. Dream on. Wishing you and yours a very merry and safe Christmas. There was a lovely surprise waiting for me when I returned from the shops yesterday. From the very talented Barb Smith. These are just a couple of the new designs Barb is working on. The box is simply divine. If you've checked out Barb's blog you will know she has made some lovely bon bons in red and white check decorated with one of her painted santa's. I hate to brag, but I received one of those as well. I am feeling very spoilt this Christmas! Now last Friday when the Friday Girls exchanged gifts, I was still short one present - Jan's. 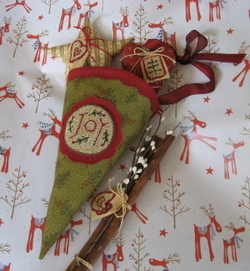 The bag (Afternoon Bag) was done the needle punched gift cone was done but not the little extras. 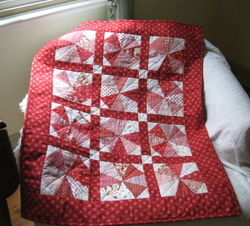 So in exchange for the gorgeous little red and white quilt Jan gave me, she got a 'promise'. 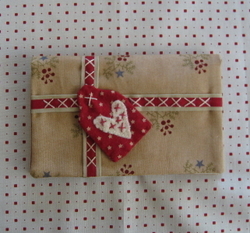 I am happy to say the little extras are finished, the gift wrapped and it was delivered and opened yesterday. I'm not very good at secrets but I had managed to pretend the new bag was for me. So imagine Jan's surprise upon opening the gift and finding it was for her. We both love the City Girl fabric and I just happened to get in first with the purchase. Now I still have a tiny bit of this fabric left and there might just be enough to make a new journal cover. Last week Azzy spent an afternoon being pampered at Gucci Poochi. Doesn't he look cute, gorgeous, angellic almost? Well, we are not speaking to him. He has just been caught eating fabric, again. Just every so often he has to snack on it. Now I admit, I do drool over fabric but have never been tempted to eat it, so it's not a habit he's picked up from me. Apart from having to toss out some favourite pieces, the real issue here is if the snack results in a visit to the vet. And it already has on one occassion. And yes, if you were wondering, the fabric was RED. Well I guess you can't fault his taste in fabric. Well I am almost done, that is making Christmas presents. Only one more to go and this won't be exchanged until Christmas night, so I've got heaps of time to get it done......... Right? The problem is I get a little (no, a lot) side-tracked. Like I suddenly had to make these birds. I've just finished needle punching a smaller version and couldn't wait to see how it would look enlarged and in coordinating reds. And it has been a few days now since I've played with my red fabric and I was starting to suffer withdrawals. Crazy, I know. They will hang from this set of draws. The loops are just the right length so they don't get caught everytime a door is opened and closed. They look much nicer in real life. Christmas came early last Friday in a gift exchange with the Friday Girls - Helen, Jan, Michelle, Nicole and Sue-Anne. These fantastic girls are sooo generous and I feel very fortunate to acknowledge them as my friends. We celebrated at Jan's home. None of my photos or words can describe just how inviting her home is. It was like walking into a patchwork shop and not knowing which sample or bundle of fabric you should drool over first. 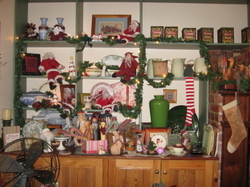 It's a wondrous mix of handmade and purchased items that have been lovingly collected over the years. And I think this is what makes it so special. This tree should be called a Memory Tree. Every decoration is a gift with a special memory attached. A lovely idea having all the pieces grouped together like this. I know I experience such a sense of joy as I carefully unpack decorations given to me over the years. Knowing that each item has been lovingly made or thoughtfully chosen makes these pieces extra special. And I have some lovely pieces to add after Friday. Now I am going to have to lift my game. 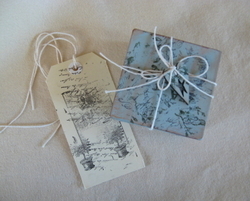 While I thought my gift wrapping skills were fair to OK, Sue-Anne excelled herself with beautiful handmade tags. How gorgeous is this? This is a gift in itself. Should I come clean and tell you about my tags? You've probably seen them - in the supermarket. Yes, John Sands does have some cute tags this year. Look what Jan made me. 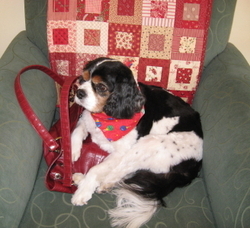 How did she guess that red and white scrappy quilts are my absolute favourite. And it looks like yo-yos. I haven't got tired of looking at all the different fabrics she's used. Some fabrics I have never seen before - what a treat! Can someone please tell me what happened to Tuesday, Wednesday and Thursday? Did these days get cancelled and no one thought to tell me. There I was on a roll Monday night and the next thing I knew it was Friday morning. 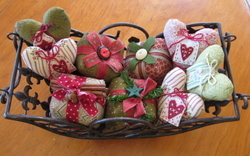 I did manage to get a few things done, like these little presents and hearts. 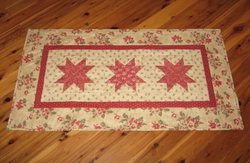 And I made this Tablerunner, but I had such plans for the week. My head was brimming with ideas that I felt sure would all come to fruition by week end, but NO. Why is it that things always take longer? An hour becomes two, two becomes four. Does this sound familar, or is it just me? And on this note I'd better get moving and start preparing lunch just in case three hours becomes six and lunch becomes afternoon!